Eight early childcare centers across the state are participating in the new Montana Harvest of the Month program. Each month, participating childcare centers, K-12 schools, and afterschool programs are showcasing one Montana grown or raised food by serving it in a meal or snack, offering taste tests to children, and doing educational activities. 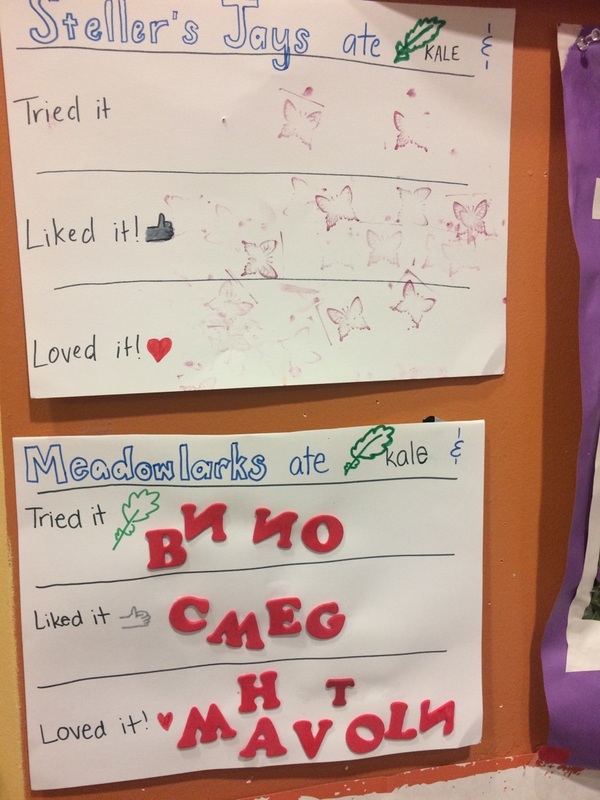 Clark Fork School, an outdoor-based preschool in Missoula, celebrated kale month in October by featuring several different recipes including kale chips and kale salad on the lunch menu. Teachers also conducted taste tests each month in which children shared whether they tried it, liked it, or loved it. The artwork the children made to celebrate local kale, including their kale paper bunches, are on display at the school. The kale served was both grown in the school’s outdoor learning garden and greenhouse and donated by local farmers.